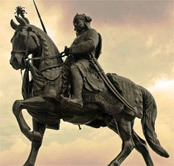 Maharana Pratap was born on May 9th 1540 in Kumbhalgarh, Rajasthan. His father was Maharana Udai Singh II and his mother was Rani Jeevant Kanwar. Maharana Udai Singh II ruled the kingdom of Mewar, with his capital at Chittor. Maharana Pratap was the eldest of twenty-five sons and hence given the title of Crown Prince. He was destined to be the 54th ruler of Mewar, in the line of the Sisodiya Rajputs. In 1567, when Crown Prince Pratap Singh was only 27, Chittor was surrounded by the Mughal forces of Emperor Akbar. Maharana Udai Singh II decided to leave Chittor and move his family to Gogunda, rather than capitulate to the Mughals. The young Pratap Singh wanted to stay back and fight the Mughals but the elders intervened and convinced him to leave Chittor, oblivious of the fact that this move from Chittor was going to create history for all times to come. In Gogunda, Maharana Udai Singh II and his nobles set up a temporary government of the kindom of Mewar. In 1572, the Maharana passed away, leaving the way for Crown Prince Pratap Singh to become the Maharana. However, in his later years, the late Maharana Udai Singh II had fallen under the influence of his favorite queen, Rani Bhatiyani, and had willed that her son Jagmal should ascend to the throne. As the late Maharana's body was being taken to the cremation grounds, Pratap Singh, the Crown Prince decided to accompany the dead body of the Maharana. This was a departure from tradition as the Crown Prince did not accompany the body of the departed Maharana but instead prepared to ascend the throne, such that the line of succession remained unbroken. Pratap Singh, in deference to his father's wishes, decided to let his half-brother Jagmal become the next king. However, knowing this to be disastrous for Mewar, the late Maharana's nobles, especially the Chundawat Rajputs, forced Jagmal to leave the throne to Pratap Singh. Unlike Bharat, Jagmal did not willingly give up the throne. He swore revenge and left for Ajmer, to join the armies of Akbar, where he was offered a jagir - the town of Jahazpur - in return for his help. Meanwhile, Crown Prince Pratap Singh became Maha Rana Pratap Singh I, 54th ruler of Mewar in the line of the Sisodiya Rajputs. The year was 1572. Pratap Singh had just become the Maharana of Mewar and he had not been back in Chittor since 1567. His old fort and his home beckoned to him. The pain of his father's death, and the fact that his father had not been able to see Chittor again, troubled the young Maharana deeply. But he was not the only one troubled at this time. Akbar had control of Chittor but not the kingdom of Mewar. So long as the people of Mewar swore by their Maharana, Akbar could not realize his ambition of being the Jahanpanah of Hindustan. He had sent several emissaries to Mewar to get Rana Pratap to agree to sign a treaty but the letter was only willing to sign a peace treaty whereby the sovereignty of Mewar would be intact. In the course of the year 1573, Akbar sent six diplomatic missions to Mewar to get Rana Pratap to agree to the former's suzerainty but Rana Pratap turned down each one of them. The last of these missions was headed by Raja Man Singh, the brother-in-law of Akbar himself. Maharana Pratap, angered that his fellow Rajput was aligned with someone who had forced the submission of all Rajputs, refused to sup with Raja Man Singh. The lines were completely drawn now - Akbar understood that Maharana Pratap would never submit and he would have to use his troops against Mewar. With the failure of efforts to negotiate a peace treaty in 1573, Akbar blockaded Mewar from the rest of the world and alienated Mewar's traditional allies, some of whom were Maharana Pratap's own kith and kin. Akbar then tried to turn the people of the all-important Chittor district against their king so they would not help Pratap. He appointed Kunwar Sagar Singh, a younger brother of Pratap, to rule the conquered territory, However, Sagar, regretting his own treachery, soon returned from Chittor, and committed suicide with a dagger in the Mughal Court. Shakti Singh, Pratap's younger brother now with the Mughal army, is said to have fled the Mughal court temporarily and warned his brother of Akbar's actions. In preparation for the inevitable war with the Mughals, Maharana Pratap altered his administration. He moved his capital to Kumbhalgarh, where he was born. He commanded his subjects to leave for the Aravali mountains and leave behind nothing for the approaching enemy - the war would be fought in a mountain terrain which the Mewar army was used to but not the Mughals. It is a testament to the young king's respect amongst his subjects that they obeyed him and left for the mountains. The Bhils of the Aravalis were completely behind him. The army of Mewar now raided Mughal trade caravans going from Delhi to Surat. A section of his army guarded the all important Haldighati Pass, the only way to get into Udaipur from the North. Maharana Pratap himself undertook several penances, not because his finances forced him to do so, but because he wished to remind himself, and all his subjects, why they were undertaking this pain - to win back their freedom, their right to exist as they wished. He foreswore that he would eat from leaf-plates, would sleep on the floor and would not shave. In his self-inflicted state of penury, the Maharana lived in mud-huts made from mud and bamboo. In 1576, the famous battle of Haldighati was fought with 20,000 Rajputs against a Mughal army of 80,000 men commanded by Raja Man Singh. The battle was fierce though indecisive, to the Mughal army's astonishment. Maharana Pratap's army was not defeated but Maharana Pratap was surrounded by Mughal soldiers. It is said that at this point, his estranged brother, Shakti Singh, appeared and saved the Rana's life. Another casualty of this war was Maharana Pratap's famous, and loyal, horse Chetak, who gave up his life trying to save his Maharana. After this war, Akbar tried several times to take over Mewar, failing each time. Maharana Pratap himself was keeping up his quest for taking Chittor back. However, the relentless attacks of the Mughal army had left his army weaker, and he barely had enough money to keep it going. It is said that at this time, one of his ministers, Bhama Shah, came and offered him all this wealth - a sum enabling Maharana Pratap to support an army of 25,000 for 12 years. It is said that before this generous gift from Bhama Shah, Maharana Pratap, anguished at the state of his subjects, was beginning to lose his spirit in fighting Akbar. The hopes of the Hindu rest on the Hindu; yet the Rana forsakes them. But for Pratap, all would be placed on the same level by Akbar; for our chiefs have lost their valour and our females their honour. Akbar is the broker in the market of our race: he has purchased all but the son of Udai (Singh II of Mewar); he is beyond his price. What true Rajput would part with honour for nine days (nauroza); yet how many have bartered it away? Will Chittor come to this market ...? Though Patta (an affectionate name for Pratap Singh) has squandered away wealth (on warfare), yet he has preserved this treasure. Despair has driven man to this market, to witness their dishonour: from such infamy the descendant of Hamir (Hamir Singh) alone has been preserved. The world asks, from where does the concealed aid of Pratap emanate? None but the soul of manliness and his sword ... The broker in the market of men (Akbar) will one day be surpassed; he cannot live forever. Then will our race come to Pratap, for the seed of the Rajput to sow in our desolate lands. To him all look for its preservation, that its purity may again become resplendent. The now-famous letter led to Pratap reversing his decision and not submitting to the Mughals, as was his initial but reluctant intention. After 1587, Akbar relinquished his obsessive pursuit of Maharana Pratap and took his battles into Punjab and India's Northwest Frontier. Thus for the last ten years of his life, Maharana Pratap ruled in relative peace and eventually freed most of Mewar, including Udaipur and Kumbhalgarh, but not Chittor. Bhagwat Singh Mewar: "Maharana Pratap Singh (was) called the light and life of the Hindu community. There were times when he and his family and children ate bread made of grass." Maharana Pratap became a patron of the Arts. During his reign Padmavat Charita and the poems of Dursa Ahada were written. Palaces at Ubheshwar, Kamal Nath and Chavand bear testimony to his love of architecture. These buildings, built in the dense hilly forest have walls adorned with military-style architecture. But Pratap's broken spirit overpowered him in the twilight of his years. His last moments were an appropriate commentary on his life, when he swore his successor, Crown Prince Amar Singh to eternal conflict against the foes of his country's independence. Maharana Pratap was never able to win back Chittor but he never gave up fighting to win it back. In January 1597, Rana Pratap Singh I, Mewar's greatest hero, was seriously injured in a hunting accident. He left his body at Chavand, aged 56, on January 29, 1597. He died fighting for his nation, for his people, and most importantly for his honor.